Why Move to Northern Virginia? Since the 2010 census data has shown that Virginia has grown by 5.1%, reaching a population of 8.4 million by this time last year. That’s faster than the nation as a whole, which only grew 4.7% in that timeframe. The majority of this growth, 60% of it as a matter of fact, is all due to Northern Virginia. So what makes NoVA such an enticing place to move to? We’re already talked about all of the companies that are moving into Northern Virginia and opening up a wealth of hiring opportunities, but NoVA is also an ideal location for those who work for the government or in technology. Northern Virginia is home to many different government agencies, including nine that have about 10,000+ employees or a $10+ billion budget. 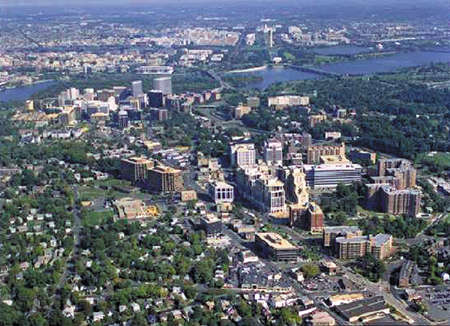 Northern Virginia also has a wealth of office space available for companies. Particularly in the Arlington and Dulles areas, there’s 33% more office space available than in Washington D.C. and 55% more than in D.C.’s Maryland suburbs. This makes NoVA an ideal location for corporations that want to be close to our nation’s capital as well as Dulles and Reagan international airports. Loudoun County is home to “Data Center Alley”, through which up to 70% of all Internet traffic flows every day. The state of Virginia has the #2 highest concentration of technology workers in the country, due to Northern Virginia being an information and communications technology hub. Not only is all of this industry pumping money into Virginia’s economy, but the Commonwealth manages their budget exceptionally well. Virginia requires state budget planners to set aside money during good years to cover budget shortfalls in bad years, because of this when the recession hit Virginia was able to use about $2 billion saved in reserves to cover budget gaps. Many companies decide to move business operations to Virginia because of the state’s fantastic record providing incentives to companies creating more local jobs, Northern Virginia’s strong infrastructure, solid economy, highly educated population, and the state’s AAA bond rating that they’ve held since 1938—longer than any other state. Virginia’s public schools consistently rank among the top 10 in the nation, and students outperform the national average in almost every age group and subject tested. U.S. News and World Report ranked 118 Virginia high schools as being among the best in the country, and all of those top 10 ranked schools are in Northern Virginia. There are over 167 colleges and universities in Virginia, which partially accounts for the highly educated population—Virginia is 6th in the nation for adults with at least a bachelor’s degree. Higher education in the state includes 120 private institutions, 23 community colleges over 40 campuses, and three of the top 40 colleges in the nation—the University of Virginia (#2), College of William and Mary (#6), and Virginia Tech (#27). Virginia is now home to 206 licensed breweries, which contribute $9.34 billion annually to the state’s economy. The soil, climate, good air, and drainage of Northern Virginia’s wine country make it an ideal region for over 100 wineries and vineyards. Northern Virginia restaurants and chefs have won national awards, even when up against gourmet food heavy-hitters like New York and San Francisco. There’s a wealth of farms and farmer’s markets where you can pick your own fruits and veggies or buy local produce. Northern Virginia’s culture is a complete blending of the urbanity that comes with being a D.C. suburb and the rural, agricultural background traced back to the Commonwealth’s colonial roots. You can find festivals—be it beer, wine, food, music, craft, or arts—almost every weekend, along with bustling “First Friday” downtown showcases, and a multitude of community centers and events through the region. Museums (including Mount Vernon and the Smithsonian Air and Space Museum), galleries and arts centers (The Workhouse Arts Center, The Torpedo Factory), performing arts venues (Wolf Trap National Park for the Performing Arts, Signature Theatre, Jiffy Lube Live), plenty of shopping opportunities (Dulles Outlets, Tysons Corner), and outdoor recreation (Northern Virginia “Horse Country”, parks, the Appalachian Trail) are all just within reach. There’s also plenty of regional and minor-league sports teams nearby, including the Northern Virginia Royals minor league soccer team and the Potomac Nationals minor league baseball team. 44.1% of Virginia residents are people of color, and Northern Virginia is a big part of that with one of the most diverse populations in the country. Students from over 200 countries are represented in public schools, and many schools participate in foreign exchange programs as well. Rapidly growing populations of people from Latin America, Asia, Africa, and the Caribbean contribute enormously to the regional economy and culture. Because of the melting pot of cultural backgrounds you can find in Northern Virginia there’s a wealth of diverse businesses, restaurants, entertainment, community activities, and religious options available. If you love history you will love living in the Commonwealth of Virginia, chartered as the first North American English colony in 1606. Northern Virginia, in particular, was a major battlefield of the Civil War. Today you can find placards marking significant sites all over the region, as well as many museums, historical houses and estates, monuments, battlefields, and historic parks. There are many smaller towns throughout Northern Virginia that feature historic downtown areas with their own local histories and sites to tour, you will never run out of interesting local tidbits to learn! Not only is Northern Virginia part of the D.C. metro area, it’s also an agricultural hub once you get further into the suburbs. There are over 1,400 farms in Loudoun County alone, an area which is also a hub for equestrians. There’s always something going on in the more urban areas of NoVA—but then you can also find plenty of biking and walking trails, gorgeous mountain views, recreational leagues, nature preserves, camping, and parks in the rural areas. NoVA has many award-winning hospitals and health care institutions, including some that are nationally ranked for their exceptional care. INOVA hospitals have received 18 Joint Commission Accreditations and Gold Seals of Approval, two of their hospitals have also received Magnet status—the highest level awarded by the American Nurses Credentialing Center. There are also organizations such as the Virginia Health Foundation, the Virginia Association of Free and Charitable Clinics, and the Virginia Health Care Foundation that ensure all citizens are able to access quality healthcare regardless of their income level. Virginia’s 8th congressional district—encompassing Arlington County, some of Fairfax County, Alexandria, and Falls Church—has the highest life expectancy rate in the country. All of these factors combine to provide NoVA residents with an exceptional quality of life. In addition, the region has crime rates far lower than the national average in almost all categories. Fairfax County has the lowest crime rate of the D.C. metro area, and the lowest rate among the 50 largest jurisdictions in the U.S.. The median household income is far higher than the national average, in part because there is such a highly educated population and so many great employment opportunities. And while that evens out with a notoriously high cost of living, it’s not so much the case for the town of Leesburg in Loudoun County (as well as some other smaller towns in NoVA). Livability ranks Leesburg as one of the 5 most affordable cities in Virginia, it has also been consistently named a great place to start a family.